3 dB Power Passing F type In-Line attenuators can be inserted in coaxial cable feeds to reduce signal levels up to 3 GHz. in Frequency with High Return Loss. Reduce UHF/VHF/FM and Digital signal sources such as TV Antennas, Cable TV, Broadband Internet, FM Antenna and Satellite TV (with DC Voltage being present!). Combinations of attenuators may be used in conjunction to add up to the exact signal loss needed. Note: There is such a thing as too much signal sometimes. Receivers of all kinds require signal present within a specific window range for proper operation. Sometimes forcing an Impedance match is the best way to maximize power delivery to Load. 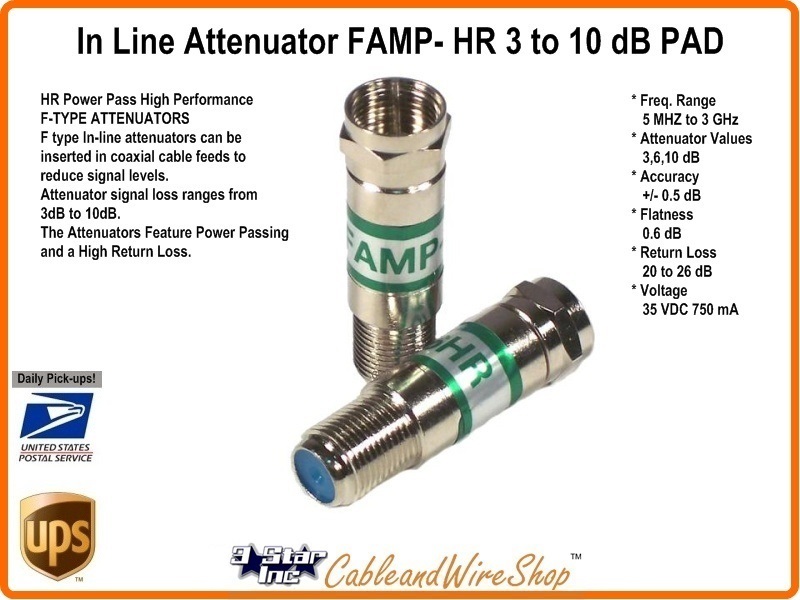 This attenuator passes voltage safely in addition to padding down signal.